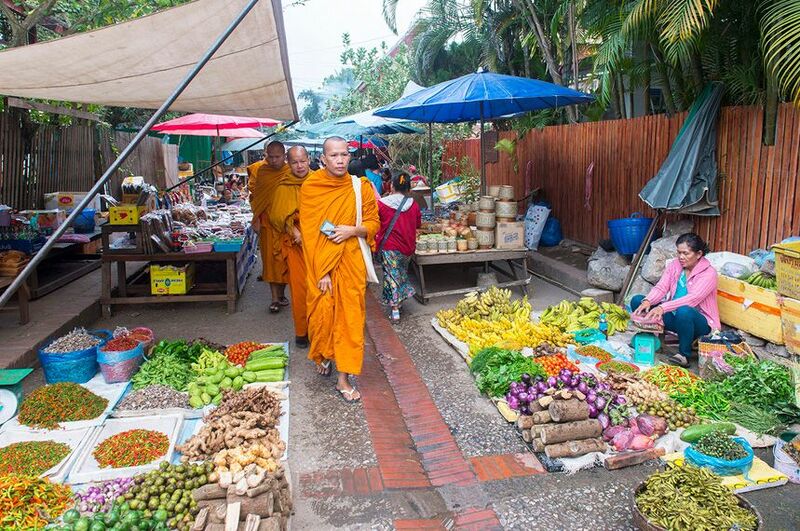 Buddhist monks stroll the city’s morning market. Luang Prabang occupies a narrow peninsula created by the confluence of two rivers, and it’s embraced by green mountain ranges. The mighty Mekong is its lifeline, still busy with fishing boats. But “as romantic as it is, Luang Prabang is also part of the in-your-face 21st century.” Stuck in traffic in a taxi one day, I watch teenagers on motorbikes flash by, including a girl riding sidesaddle with her face pressed to her cellphone. I learn soon enough that the city goes quiet in the heat of midday and that vendors start arriving with their goods at the night market in late afternoon. One evening, I wander amid the crabs, fish, textiles, and jewelry, then join Van on a slender boat that he’s rented for a party on the Mekong.